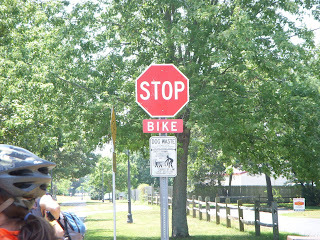 I went on an excursion down to the Shore, on Saturday, with the Bicycle Club of Philadelphia and the Suburban Cycling Club. We met at 30th Street station, loaded our bikes onto a moving van, and then we hopped onto NJ Transit, taking the train to Absecon, New Jersey. From there we took our bikes off the moving truck and then rode down to Ocean City, NJ, a 15 mile trek through Pleasantville, Northfield and over the Sommer's Point bridge, into OC, and over the Ocean City Bay Bridge. It was a perfect day for biking, warm but breezy, with bright sunshine to illuminate the day and bronze the skin (provided you had on enough sunblock to avoid a burn.) As we rode along the bay side of the Ocean City Bridge, a cool, salty breeze blew over us. It was refreshing and whetted our appetites literally for the delights awaiting us on the boardwalk. 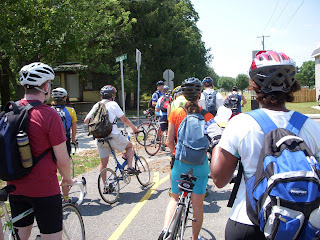 The riders comprised a group of 16 people, all of them friendly, helpful, entertaining and bicycle informative. While we didn't have much time to spend on the Boardwalk in Ocean City, only about 2 hours total, the entire trip was fantastic. It was such a treat to be able to ride to a far off destination, but not to have to pedal down the entire way. The 30 mile round bike trip was just enough for me, though I could have pushed and ridden at least another 10 to 20 miles with enough rest and snack stops along the way. 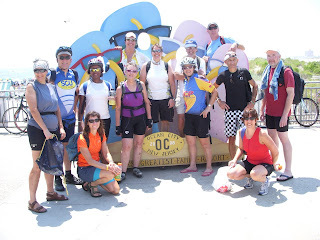 The photo above is of most of the group once we made it to the Music Pier at Ocean City. That's me in the center. What a difference from where I was a year ago - 62 pounds heavier, without a decent bike, and in no shape to ride more than 5 miles in a day! 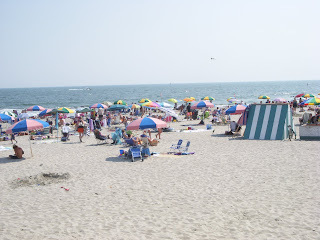 On my days when I wasn't working, sleeping off a hangover from my staying out all night at the gay bars in AC, partying with the vampires, I would ride my bike to the beach, to work on my tan. Those were the days before sunblock with SPF 45 and higher! We were still slathering on baby oil and squeezing lemons into our hair to turn it blond. 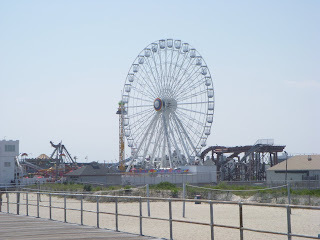 Thanks to my legs of steel and youth, I could pedal fast to get through the rough and tumble parts of Pleasantville and Atlantic City before I could hit the safety of Margate, Ventnor and Ocean City. The bike trail, as it is now, was nowhere in existence back then. 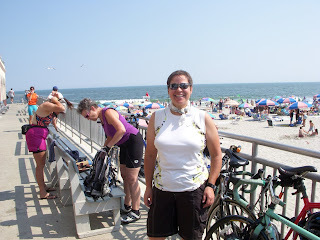 If it had been, I may have been persuaded to last longer at the shore; a ride to the family friendly beaches would have beckoned me to explore further parts of the South Jersey shore. Food memories are so closely tied to my down the shore memories. 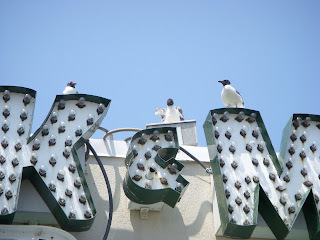 The photo above is a detail from the Mack & Manco Pizza sign, with surly seagulls looking down at pizza buyers. Fine dining isn't the norm. Back then it was nothing but boardwalk fare. 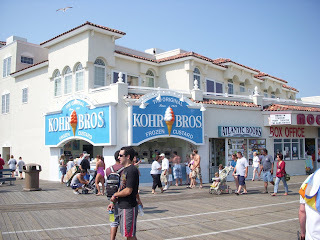 Then as now, there are several must haves on the Ocean City Boardwalk, but not all at once: Mack & Manco's Pizza; Kohr Bros. Custard; Curly's Fries; Johnson's Caramel Popcorn; the burgers & donuts at Browns; Fudge or any kind of candy from Shriver's. Rather than fall completely off my Weight Watcher's Wagon, I was wise and had a slice at Macks and a burger at Brown's. I brought fudge back for Liz, so she could enjoy a little piece of "downtheshore" too. The Ferris wheel, at Wonderland Pier. At night you can see the Ferris wheel's lights shinning from as far away as Brigantine and over the causeway's for miles and miles. It's a really huge Ferris wheel. It takes 15 minutes for to ride the entire revolution. You get your money's worth and quite a bird's eye view of the surrounding shore towns. 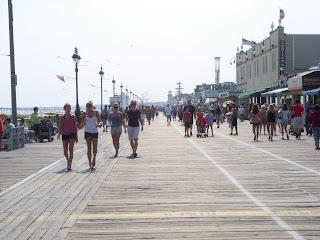 The boardwalk in Ocean City is about 3 miles long. It's great for biking in the morning. I love to ride a beach cruiser or rent a surrey, with the fringe on top, and pedal along with other people in tow. It's such a laugh riot to be one of those bicycle carriages, you feel like you have pedaled back in time. In this shot, you can see the crowds already filling up the boards at 3:30 in the afternoon. Kites are flying in the distance, and the beach is still full of bathers and surfers. 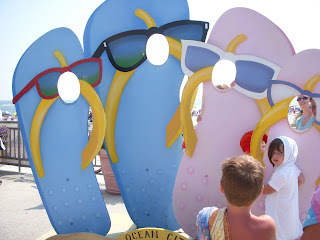 The famous, Ocean City Flip Flop Sign. Immortalize yourself and family and pose with your head popping through the sunglasses!